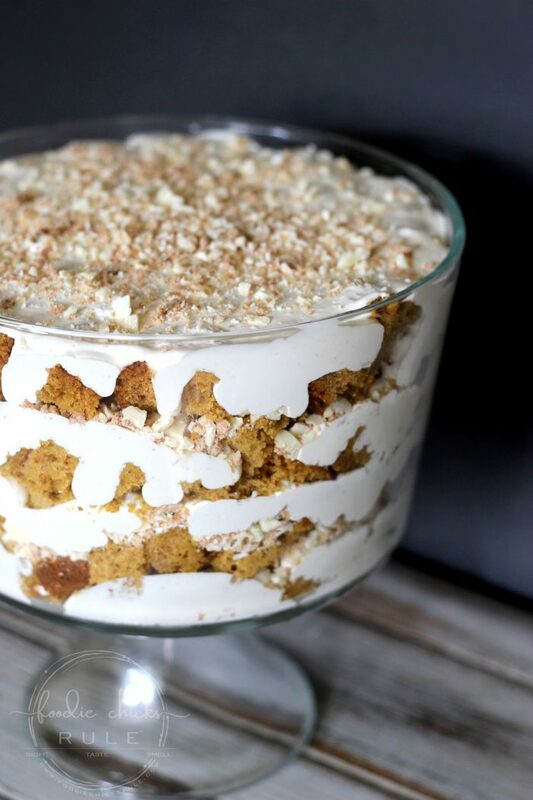 You can never have too many pumpkin recipes in the fall, don’t you agree? 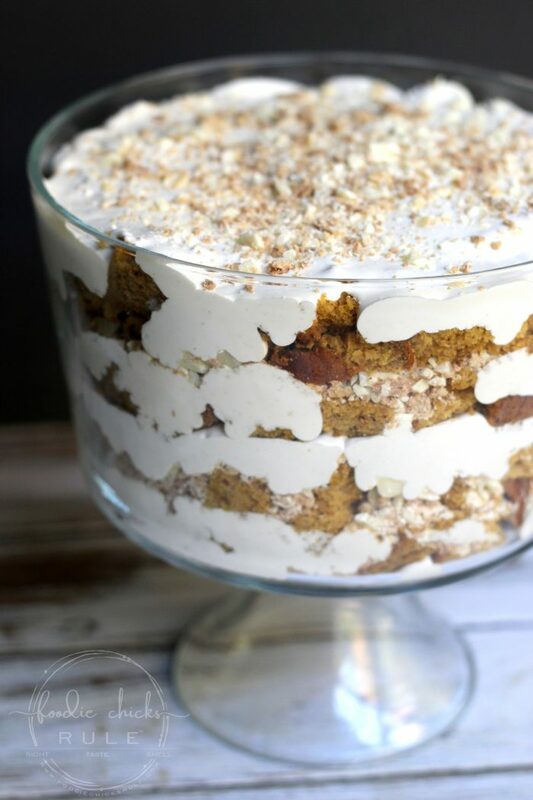 One of my most popular recipes is a trifle so I thought I’d turn my delicious pumpkin bread recipe into one too! 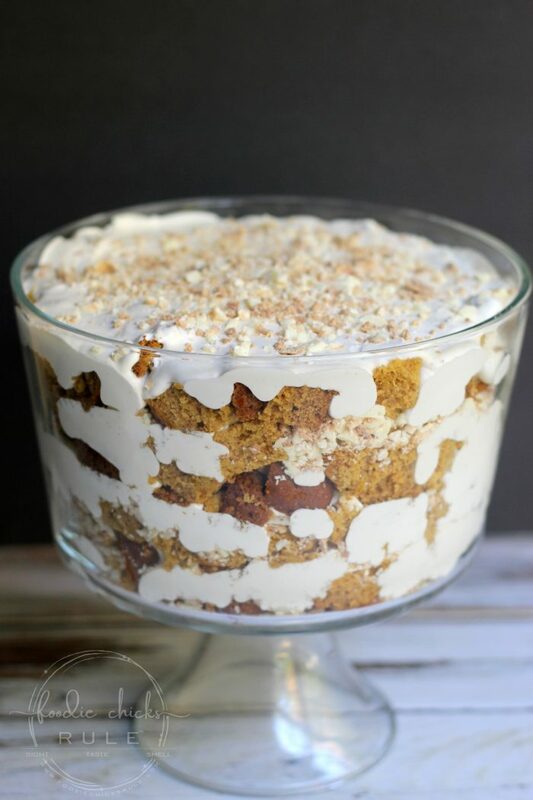 And with an added little surprise to this already delicious pumpkin bread trifle! 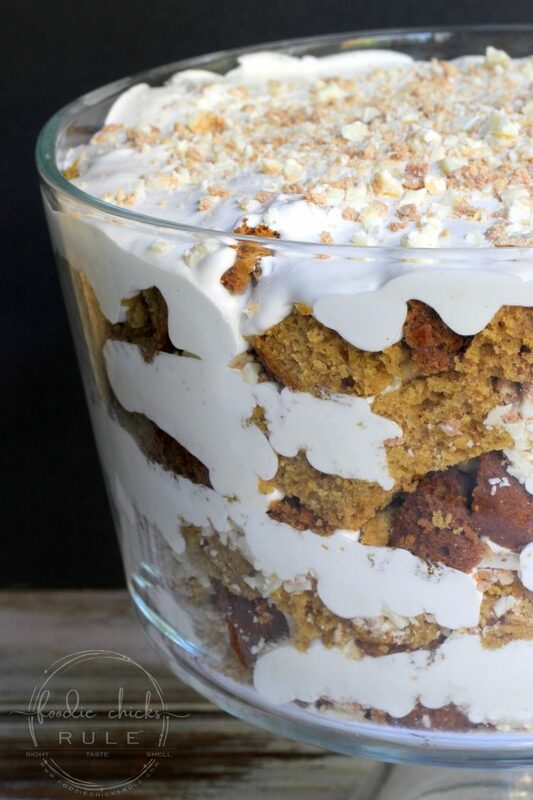 You might be wondering why I called this pumpkin bread trifle … “surprise”. 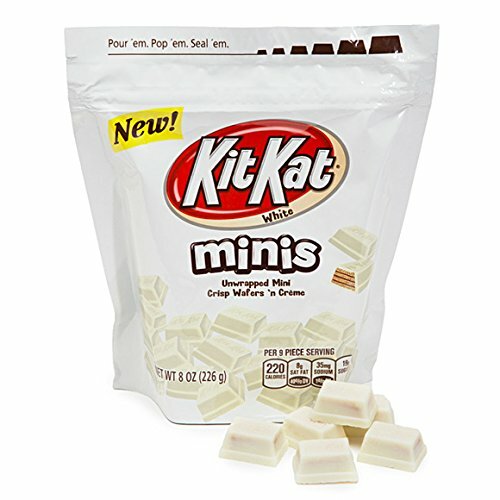 That magical, secret, surprise ingredient is this…..
White Kit Kat bars. Well the minis were what I used this time, the bars work fine too. One of my most popular recipes over on Pinterest is my Red Velvet Trifle. 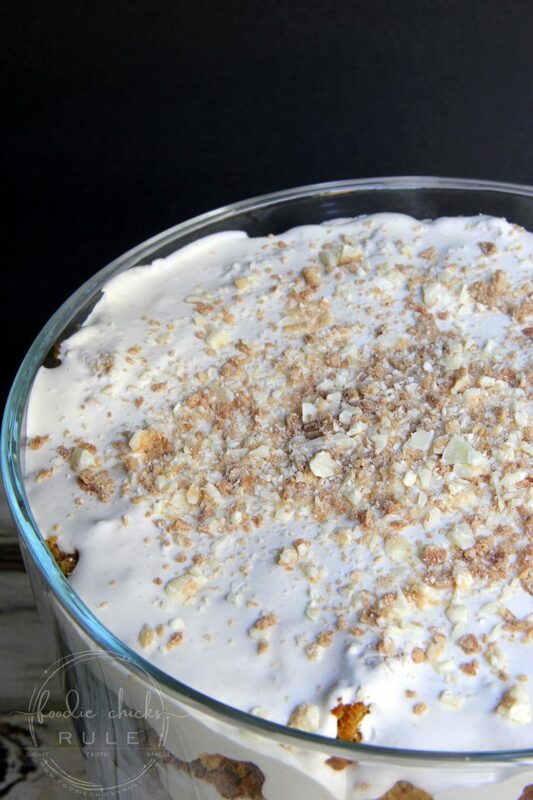 You can find that delicious recipe here, Red Velvet Trifle recipe. The reason I mention that is because I used white Kit Kat bars in that recipe too. Yummy. 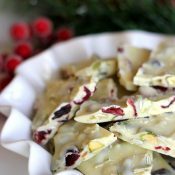 It gives an otherwise typically soft and mushy dessert a little “crunch”. 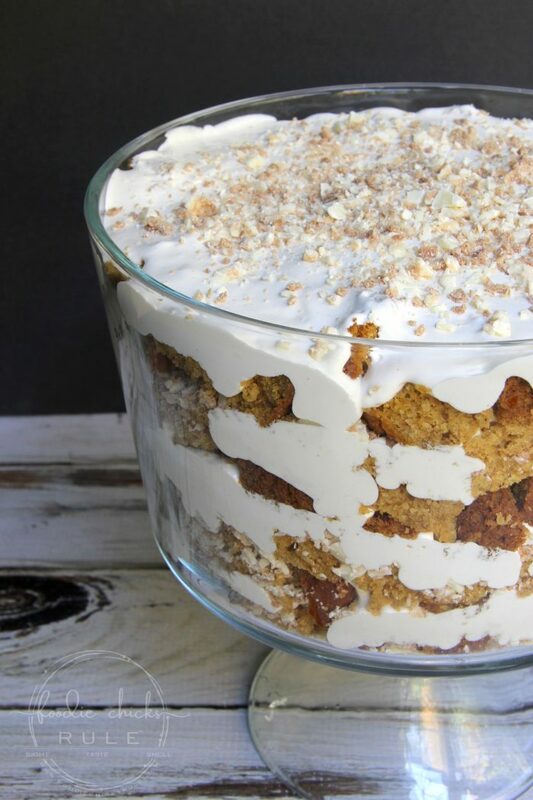 So when I thought of throwing together a pumpkin bread trifle, I figured, why not? I start out by making my pumpkin bread the night before. You can find the recipe for my pumpkin bread, here. Make the recipe as described minus the cream cheese filling. 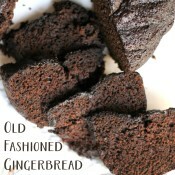 Pour into 2 loaf pans instead of the bundt pan. 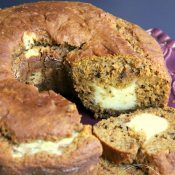 -OR- you can use your own recipe for pumpkin bread or even pick one up at the grocery store, if they have them. Bake and let them cool completely. 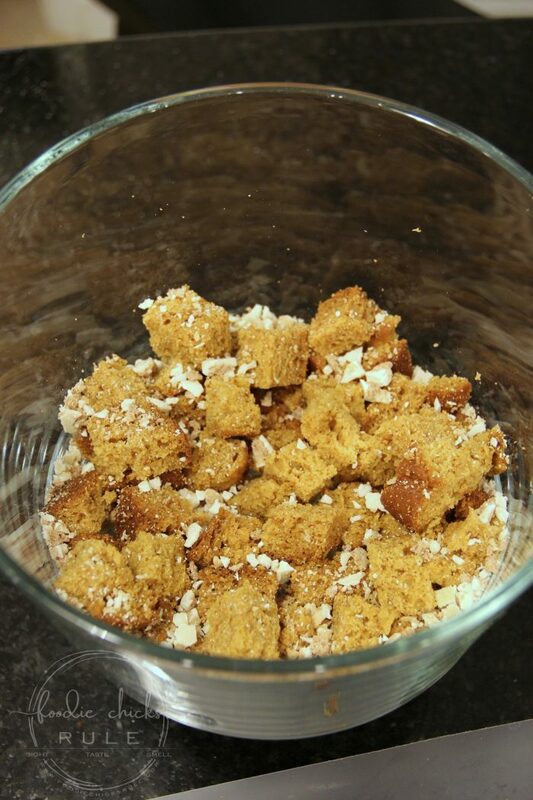 Remove from the pans and cut into cubes. 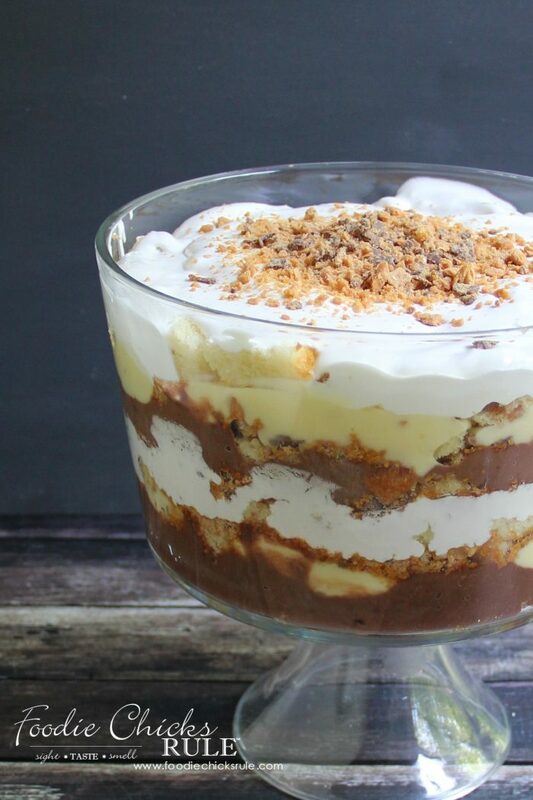 The recipe for the trifle part is exactly as shown in the Red Velvet Trifle link I shared above. Just mix the cream cheese and 8 oz whipped topping in one bowl and vanilla pudding and remainder of the 8 oz whipped topping in another bowl. 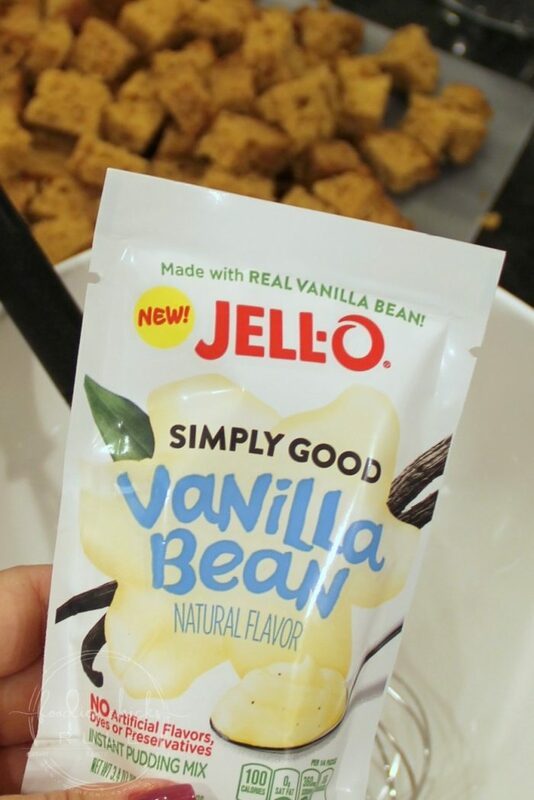 I tried this new Jello brand natural vanilla pudding this time. You can see all those vanilla bean specks in the photo above. I like that it is more natural, plus it doesn’t look as yellow in the finished dessert, which is nice. I also used Almond milk instead of regular milk because I try to limit my dairy. If you also sub this, use only 1 cup of almond milk instead of the 2 cups of milk it calls for. Layer the ingredients by starting with the cubed pumpkin bread. Sprinkle a bit of the chopped Kit Kat bars over the bread. Then add a layer of cream cheese/whipped topping mixture. Then add another layer of bread and Kit Kat bars….. But this time, add the vanilla pudding/whipped topping mixture over top. Repeat until you are done. I usually try to finish with the vanilla pudding mixture but it really doesn’t matter which one. Sprinkle with more of the chopped Kit Kat bars as a garnish…. I actually enjoy it even more after it sits in the refrigerator over night. All the flavors have a chance to mix and it’s just wonderful. Remove the whipped topping from the freezer and cream cheese from the refrigerator to soften. Once it's cooled, remove from loaf pans and cut into cubes. Set aside. 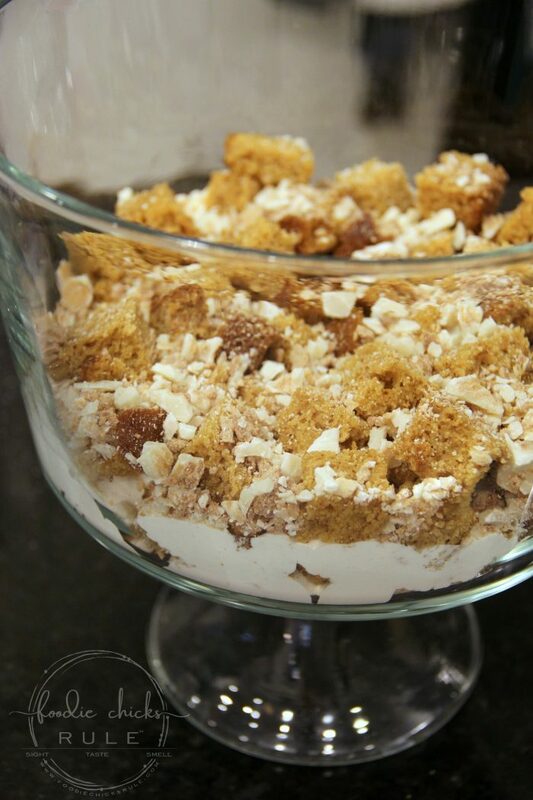 In one bowl, mix half of the softened whipped topping with the softened cream cheese. Add one tsp of vanilla and the 1/2 cup of sugar, mix well. In another bowl, make the vanilla pudding according to the directions. I used Almond milk in mine (only 1 cup) instead of the 2 cups of milk it called for. 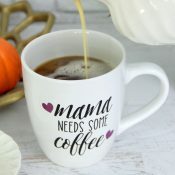 Since it doesn't set as well with sub milks, 1 cup will keep it from being too loose or runny. Mix the other half of the whipped topping with the vanilla pudding. 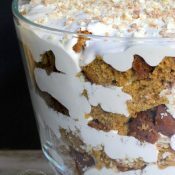 Add one layer of pumpkin bread cubes to the bottom of the trifle bowl. Layer chopped Kit Kat bars over top. Add one layer of cream cheese mixture, followed by another layer of bread and Kit Kat bars. Add one layer of vanilla pudding mixture, followed by another layer of bread and Kit Kat bars. Continue until done. 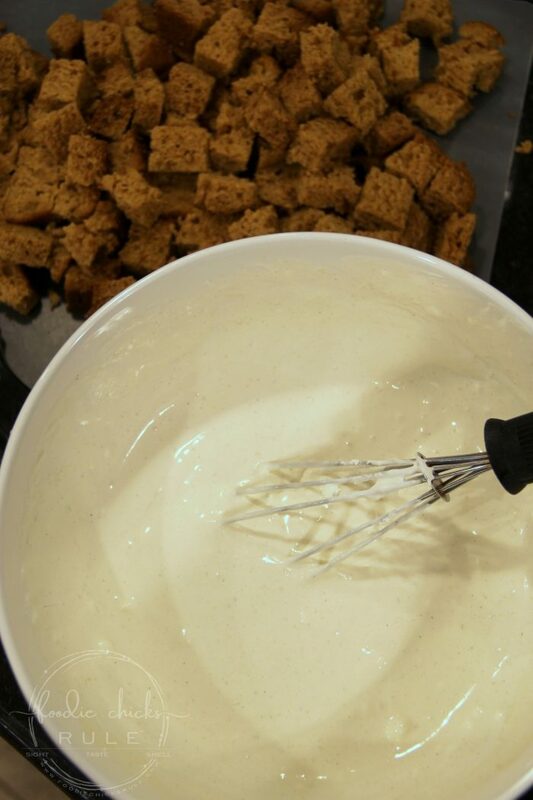 Finish up with either the cream cheese or vanilla mixture and sprinkle chopped Kit Kat bars on top as a garnish. Refrigerate overnight before serving, for best results. 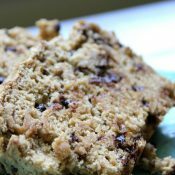 You can use store bought pumpkin bread or your own recipe. 1 cup of unsweetened almond milk can be subbed for the milk in the pudding. You can serve this right away but I find that it's better after sitting overnight. This gives all the ingredients a chance to blend together a bit. 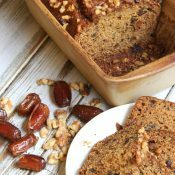 This recipe can be made gluten free by making the pumpkin bread as shown in the post linked. This looks so good! I know it wouldn’t last long at my house. Adding the Kit Kat bars is genius! Can’t wait to try this! In your recipe directions you say to combine the cream cheese and whipped topping. There is no cream cheese given in your ingredient list. How much cream cheese is used?